Erasing or deleting all the data from the device becomes important when you plan to sell it or hand over to a close friend. This is because you don’t actually know about the person who is going to be the owner of your device. In other words, maybe that person is not trustworthy enough to keep your private data private if found any. 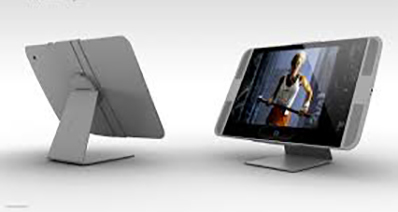 Therefore, it is recommended to remove all the data from the device prior to selling it. For the erasure, we are going to share 10 Android Data Eraser Software which will help you erase Android phone completely. iSkysoft Toolbox - Erase (Android) is among the top leading erasure software that will help keeping your privacy to yourself by wiping Android phone completely without leaving a pinch of your secrets. This software is reliable since it takes pride in secure deletion of Android device so that anyone would not able to access your precious data again. Nearly all Android devices are compatible with iSkysoft Toolbox - Erase (Android)s. We will provide you how you can wipe data from Android using this tool. But first, let us know its features deeply. The tool is able to delete everything from Android device permanently and easily. The data becomes irrecoverable when wiped with this software. The tool promises full and 100% security for keeping your data safe from any leakage. 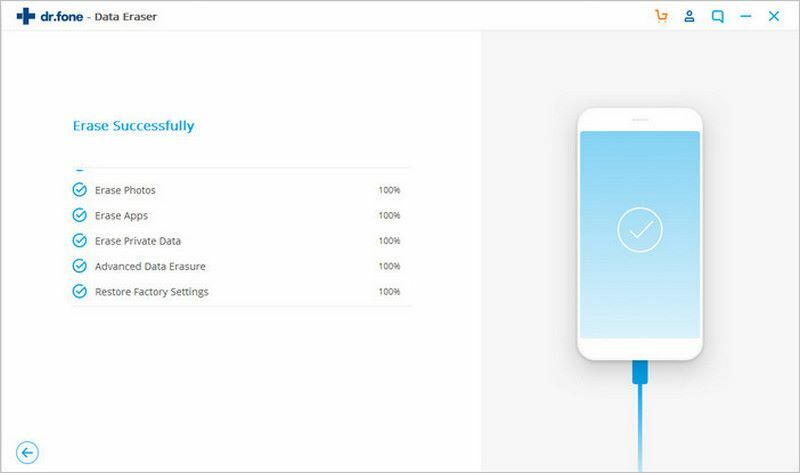 Along with a sound Android compatibility, it fully supports a large number of file types like your contacts, photos, voice memos, app’s documents, videos, call history and many more. Firstly, you need to download iSkysoft Toolbox - Erase (Android) and then install it. Launch it later to enter the main interface and click on “Erase” from there. 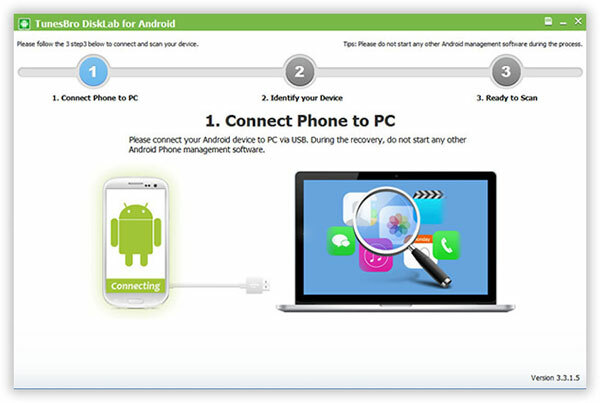 Now, connect your Android device with the PC and enable “UDB Debugging” in your device. 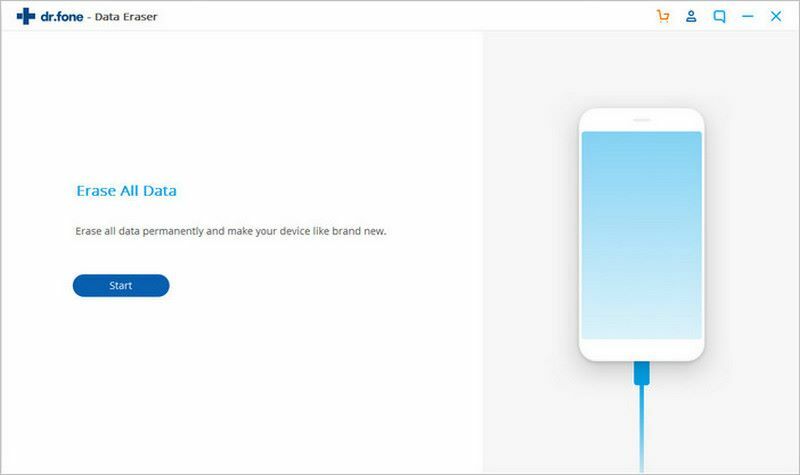 As soon as you connect your device, you will spot a button saying “Erase All Data”. Now, you will enter the next window which requires you to type “delete” in the given box and then click on “Erase Now” button. This step is done for the deletion confirmation. After completion of wiping of phone, you will be prompt to Factory Reset your data. This step is essential in order to delete all settings in the device. Complete Wipe will help in erasing Android phone completely as what its name says. It comes in handy when you want to remove all sensitive data from your device using your phone only. This Android eraser gives an auto alert service where people will receive regular alerts in case of being the device stolen or lost. 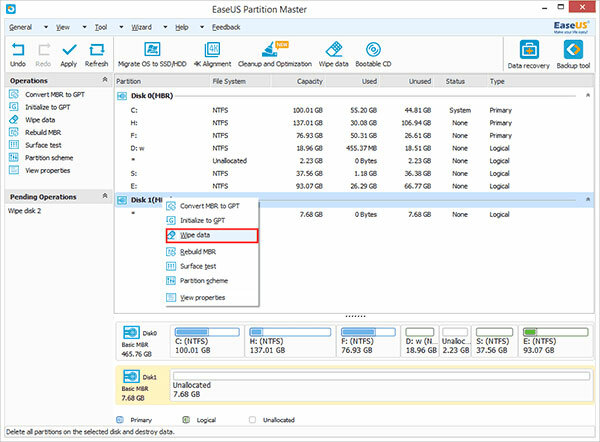 The next software that will help you to wipe phone is EaseUS Partition Master. This software is basically for computer, however you can use it as data wiper as well. It removes unwanted and sensitive data on selected partition and help maintaining your privacy. The tool comes in various languages for the convenience of the users. 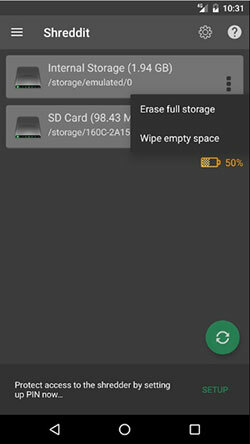 Shreddit can also help you to wipe Android phone’s data forever. 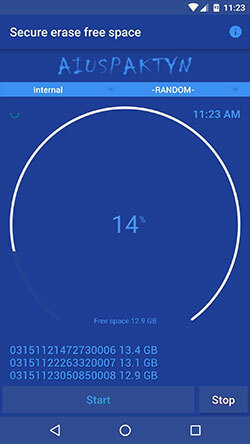 You can use it on your device’s internal as well as external storage data. 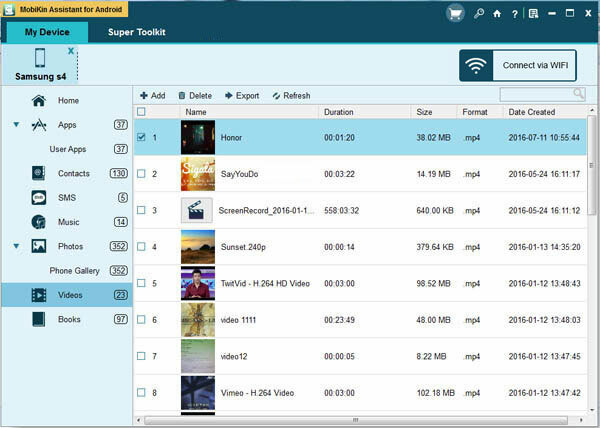 The app gives benefit of previewing media files also. 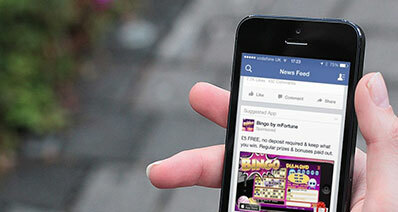 Review: "Nice app, but i have used other apps that does does the same but much faster. (This app does the work slowly.)" 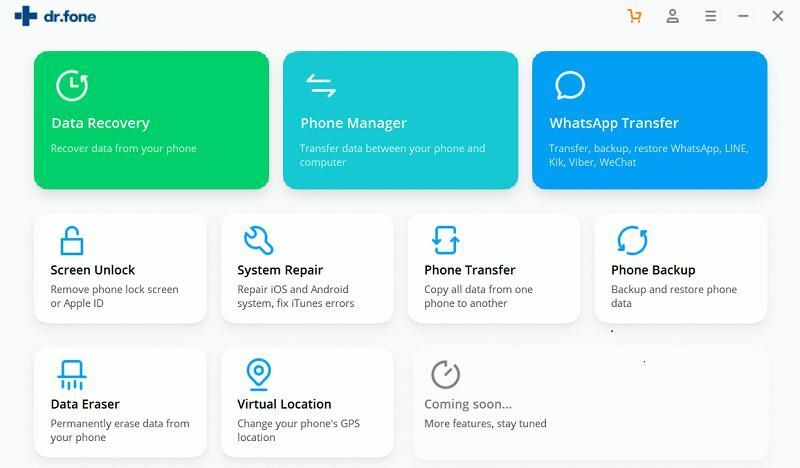 The fourth in the list is SafeWiper for Android which comes with three built-in wiping modes namely, “Erase All Data”, “Erase Private Data” and “Erase App Data”. More than 2000 Android devices are supported via SafeWiper for Android. This tool is free of any risk and overwrites your device to make the data completely irrecoverable. 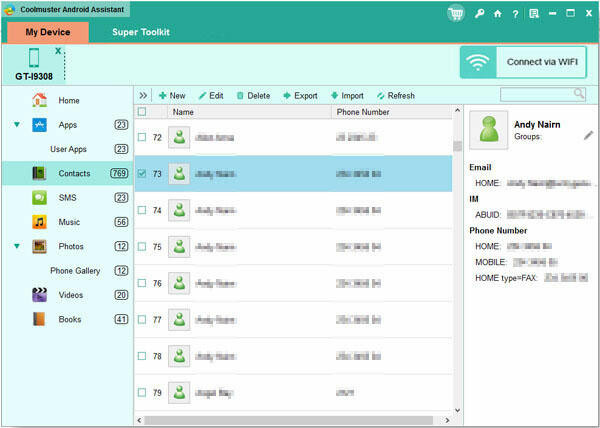 A lot of file types are supported including call history, contacts, chat history, messages etc. A yet another data protector or data eraser to get help in order to wipe Android phone is Coolmuster. You are allowed to delete your messages, photos, videos, contacts and many more data types in just one click. 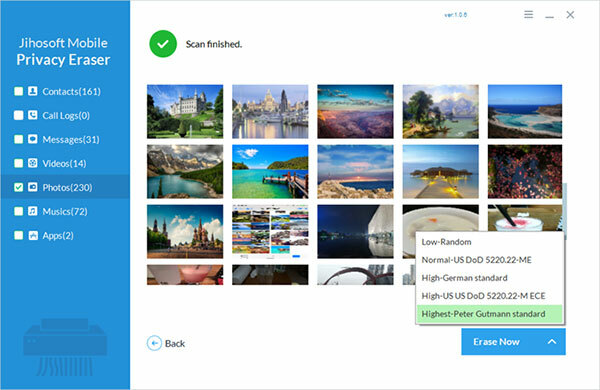 Coolmuster offers three modes for erasing data safely. The three modes are designed to choose according to your needs which are named as low, medium and high. The tool is easy to use as well as perfectly safe promising no data leakage. TunesBro DroidWiper is number sixth software to use when you need to wipe phone for any reason. The tool is fully compatible to over 1500 Android devices and takes care to wipe everything permanently. You can either delete your private data, app data etc. It takes only 3 steps to remove everything from your Android device with TunesBro DroidWiper. 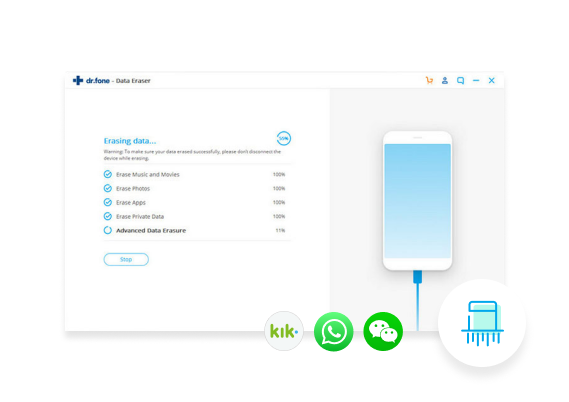 There are a good quantity of data types that are supported via TunesBro DroidWiper like messages, photos, videos, WhatsApp and more. Here is the next software which promises to wipe Android device completely and forever. You can easily get it from Google Play and clean your device with just one click via this software. 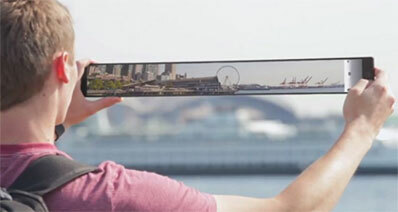 This promises to offer high compatibility with your various Android devices. This tool takes easy operation to work with and there is no need to grasp any technical understanding before using it. Another option to choose for removing your private data permanently from your Android device is Jihosoft. 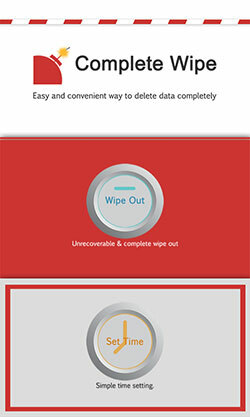 It also offers 3 steps to completely erase your data like Android contacts, messages, call logs, videos, apps etc. You can buy this Android eraser in $39.95. Jihosoft Mobile Privacy Eraser can work on various Android device be it your LG device, HTC or Samsung. You get three erasing options with the Android eraser tool and those options are named as “Erase Deleted Data”, “Erase Existing Data” and “Erase All Data”. You can choose the options according to your needs for erasing your data. MobiKin is the last option in the list you can try to remove all your Android data permanently. 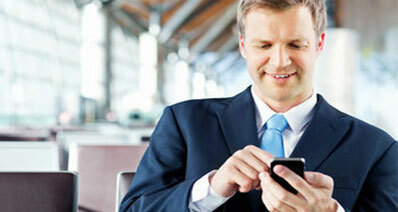 The supported data types comprise text messages, call logs, notes and many more. This data eraser for Android will also make sure to completely delete your files and no one will be able to get those back.